After orchestrating the action sequences in his father's directorial venture Rajanna, S S Rajamouli is now concentrating on Eega (Housefly), a bi-lingual (in Tamil it's titled Naan ee) starring Nani, Samantha and Sudeep from the Kannada film industry. The film, loaded with special effects, is produced by Sai Korrapati. that remembers the incidents of his last birth! Naturally, the fly then takes its revenge on the villain. The plot is certainly novel. And since such a film demands a lot of graphics, Rajamouli has got Senthil Kumar who shot Magadheera to shoot Eega. M M Keeravani composes the music, Ravindra is the art director and the editing is done by Kotagiri Venkateswara Rao. 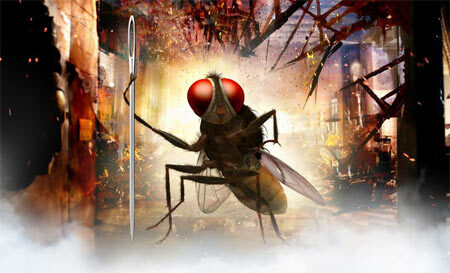 Eega is scheduled for a summer release.